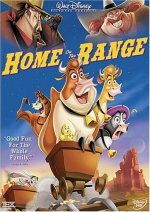 Home on the Range release date was Friday, April 2, 2004. A family farm inhabited by a widow (Sarah Jessica Parker), her young daughter, and various and sundry farm animals. The widow owes $1,000 mortgage on the farm and has no way to pay for it, and the cows get wind of the trouble. Fearing that they'll be sold to the local meat- packing plant, the cows seek to find a way to earn the money. Enter the family horse, played by Cuba Gooding, Jr. He used to belong to a bounty hunter, and knows a great way to save the farm. You see, he's heard that in the nearby town, there's a bandit afoot (Randy Quaid), with a $1,000 bounty on his head.